This is actually a copycat recipe. I had hummus from this company and it was SO delicious. And the flavor was really easy to replicate. There's nothing wrong with being a little thrifty now and then. Combine all ingredients in a food processor until a smooth puree is formed. For a thinner consistency, add 2-3 Tbsp water. *Note: due to the saturated nature of coconut milk, this hummus does "set up" a bit when refrigerated. No worries! Just stir prior to serving. Serve with crudites or pita chips. Can I put really tequila into a salsa? And not cook off the alcohol? You would have to eat the entire 10 cups in one sitting to even get a buzz. And the flavor? So worth the risk. Combine all ingredients in a large bowl and toss to coat. Cover and refrigerate for 2 hours prior to serving. Serve with tortilla chips or on top of your favorite tacos. Confession: I love fried ice cream. Typically served at Mexican restaurants, fried ice cream is a scoop of vanilla (or sometimes cinnamon) ice cream that is battered and deep fried and served sprinkled with cinnamon and sugar or drizzled with chocolate or caramel. Yes, the ice cream stays frozen. This is like that. But it's not. And you are healthier for it. And it's gluten-free for my GF friends. Crunchy outside, creamy frozen center, and a dash of cinnamon. Amazing. Mix together crushed cornflakes and cinnamon. Place them in a bowl. Line a cookie sheet or plate (that will fit into your freezer) with parchment paper. Use an ice cream scoop to scoop 1/2 cup of frozen yogurt into a ball (think like at Baskin Robbins). Roll each ball in the cornflake and cinnamon mixture. Place each ball onto the cookie sheet. Repeat with remaining frozen yogurt until you have 16 covered scoops. Place plate or cookie sheet into the freezer to re-freeze for 1 hour prior to serving. * Note: you may need to do several batches on smaller plates to keep the scoops frozen- it depends on your speed of scooping and rolling. Serve drizzled with caramel or chocolate syrup, if desired. This is the recipe for those who do not like to eat fish. This is the recipe for those who do not like to touch fish. 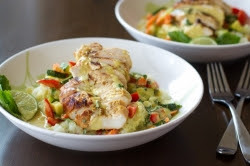 Fortunately, this is also the recipe that those of you who LOVE fish will enjoy as well. One dish, minimal fishy contact, delicious result. In a large saucepan, heat olive oil over medium-high heat. Add minced garlic and fennel seed. Saute until fragrant, ~ 3 minutes. Add in marinara sauce and water and bring to a simmer. Sprinkle halibut with salt and pepper. Reduce heat to medium-low, stir in basil, then gently place halibut filets into the sauce. Scoop sauce over the top to cover. Cover saucepan and cook until fish is opaque and easily flakes, ~ 10-15 minutes. Serve 4 oz of fish covered with marinara. As I was dreaming up this salad, complete with butter lettuce, nature's butter (avocado) and butter beans, I asked my hubbster what else it needed. He said "Bacon". Of course, I scoffed. And then I thought about it. Could he be right? And then I made a Butter & Bacon Salad and he was right. Hear that, honey? You were RIGHT. In a nonstick skillet over medium-high heat, cook chopped bacon until crisp. Add butter beans and vinegar to the skillet and saute ~ 2 minutes. Whisk in honey and mustard. Continue to saute beans until warm and vinegar has thickened and reduced slightly, ~3-4 minutes. On each plate, layer 5-6 lettuce leaves. Spoon bean mixture on top of lettuce and drizzle evenly with remaining skillet liquid. Top with avocado slices and green onions. Sprinkle with salt and pepper and serve.